My students often ask me how I come up with my own tricks and combos. 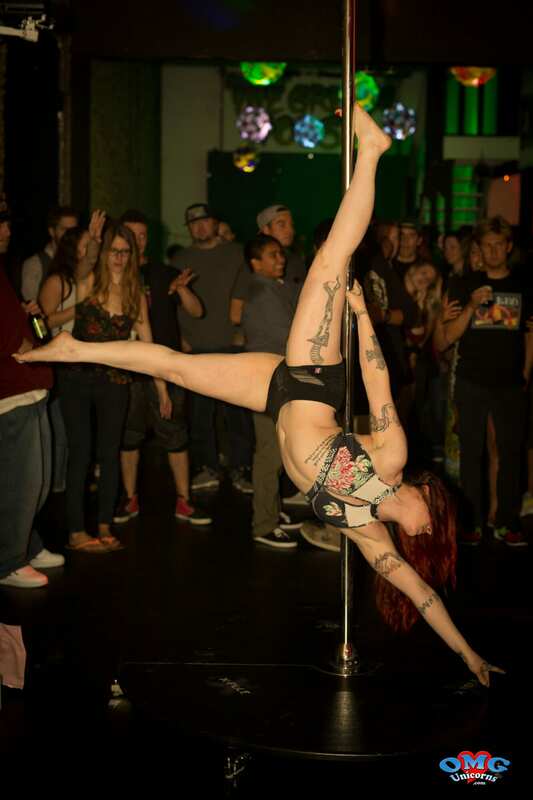 I also remember when I started learning pole and how badly I wanted to have my own signature trick. I recall racking my brain for “new” ideas and eagerly searching the internet when I thought I might have come up with something new. I would like to share what I’ve learned since then on this topic. First, I have never created a trick when I was setting out to do something new. After talking with other dancers, I think that this is usually the case. It’s very difficult to be inspired when you feel pressure to accomplish something. You will also likely have a much more productive training session if you just try to dance or have more clearly outlined goals – I know I certainly do. Photo 1: Love this Shape! One of the most common scenarios that inspires a new trick or transition is simply a mistake. A couple of years ago, I learned a transition from a recliner invert to an iguana grip pencil. I really liked this trick and I did all the time – I even put it in a competition routine. A bit after that, I had an idea to attempt to reverse the order of all the transitions and combos I knew. I tried to do that with this particular combo. Needless to say, reversing it (going from an iguana grip pencil to a recliner invert position) was difficult for me. At some point after trying it a number of times, I slipped into a beautiful poisson shape. Check out Photo 1. I’m sure someone else has done this trick too, but I’ve never seen anyone do this particular transition. This is now a trick that I include in just about every routine. I’ve even come up with a one-handed variation now (Photo 2) and a drop out of it. This leads me to another method that inspires me: challenges. While training, I sometimes give myself a “challenge.” I find this to be very helpful in improving my pole abilities but I also sometimes find new pathways. Here are some ideas for challenges: only use your bad side for an entire training session (if you have one! 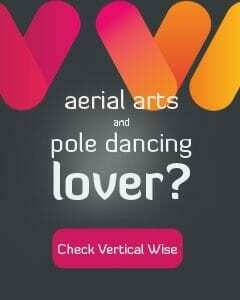 ); do all your spin pole tricks on static, and vice versa; wear large awkward clothing; stay on the pole and don’t touch the floor for an entire song; invert (or turn it sideways for a harder challenge!) 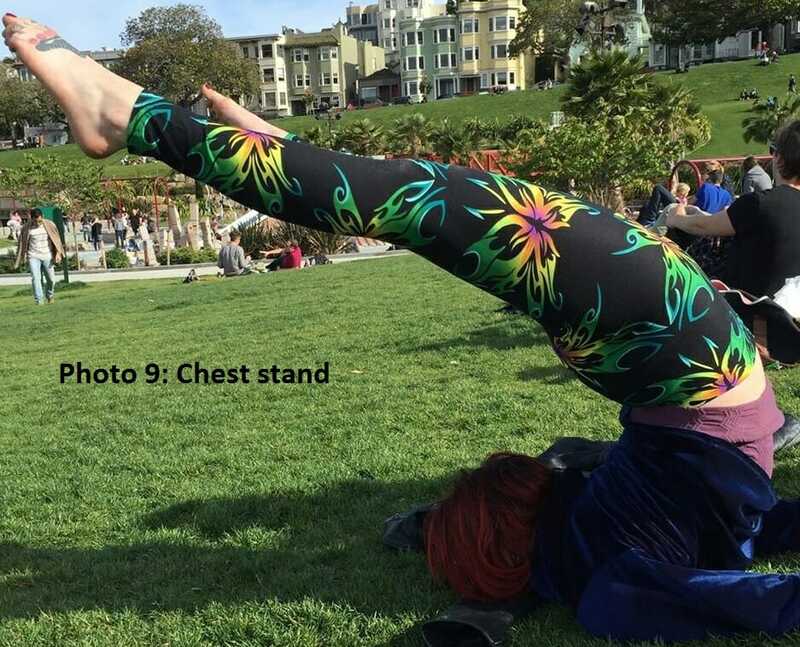 every pose you know, etc. Third, I often come up with new tricks because my body simply cannot make a particular shape that someone else’s can! So many times in workshops, the instructor taught some crazy split, and I just couldn’t do it. So I created my own shape. For example, I often try to change a splits trick into a back-bendy trick if I can. There’s nothing wrong with not being able to do everything someone else does – that is part of what makes you unique as a dancer! I’m very interested in many forms of movement, and often my inspiration comes from tricks I see in other disciplines – yoga, dance, gymnastics, aerial hoop, corde lisse, etc. Many times I’ve seen beautiful shapes and tried to replicate them on pole (and vice versa). I’ve currently been working on doing a reverse bird’s nest from aerial hoop on a pole. Now after you’ve come up with your own moves, you will inevitably be scrolling through Instagram or Facebook and you’ll see someone else doing the same thing. It’s easy to be a bit disappointed. It will happen, but don’t let it get you down. Who knows who really created any trick first? Who cares? The important thing is you did something without being told exactly how to do it. You also likely have a different transition in or out of it, and you probably do it with your own flair. If it’s a trick that few people do, that’s cool too. A while ago, I was certain I had created a totally new shape. I was inspired by the bird of paradise pole trick and a yoga pose called the dancer/mermaid. Of course, I really wanted to be able to do the bird of paradise, but my body just was not limber enough for that yet. However, my back was pretty bendy. So, I thought, why not catch my foot in my elbow behind my back instead of in front of my torso? I knew it had to be possible, but it was difficult to get into it. Finally, after trying it for a few weeks, I got it. I was so excited! I named it the mermaid. Check out Photo 3. I searched everywhere and didn’t see anyone else doing it. About one year later, I saw a huge poster of Ashley Fox making the same shape. I think she calls it the foxtail. I have to admit, I was a little bummed. However, to this day I still have never seen anyone else do it. If you want to try it, I start in a superman, drop one leg down towards the pole and sickle that foot around the pole, then hook my elbow around the pole, and finally hook my foot in my other elbow and connect my hands. I hope these tips help you and have fun creating, and don’t forget to just dance sometimes! I’d love to see your new tricks here too! To Plan or Not to Plan THAT is the Question!